While Canberra celebrated its 100th birthday in 2013, European settlement of the Canberra region dates back to the 1820s. Many reminders of the 19th century remain in buildings such as the Old Lyneham Inn, Duntroon Homestead and Tharwa Bridge. However, you can sometimes find less obvious and forgotten remnants of Canberra’s rural past hidden away in our suburbs. Some of those hidden remains are short sections of rural roads, some of which have origins dating back to the 1830s. 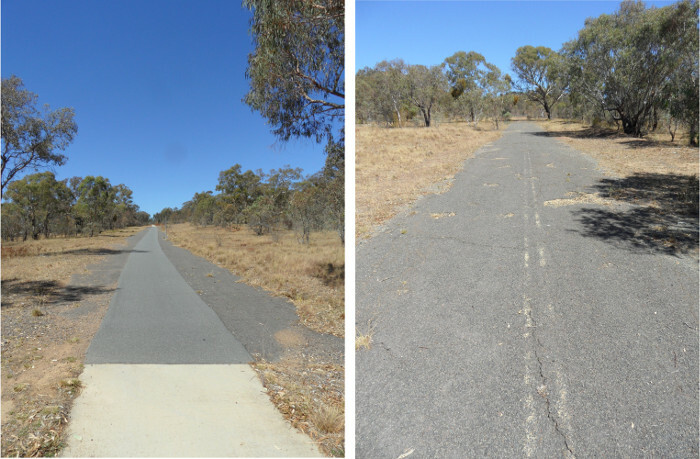 These rural roads form an interesting component of the early settlement of Canberra that is still present to explore. Often all sign of these roads disappear during the construction of new suburbs. 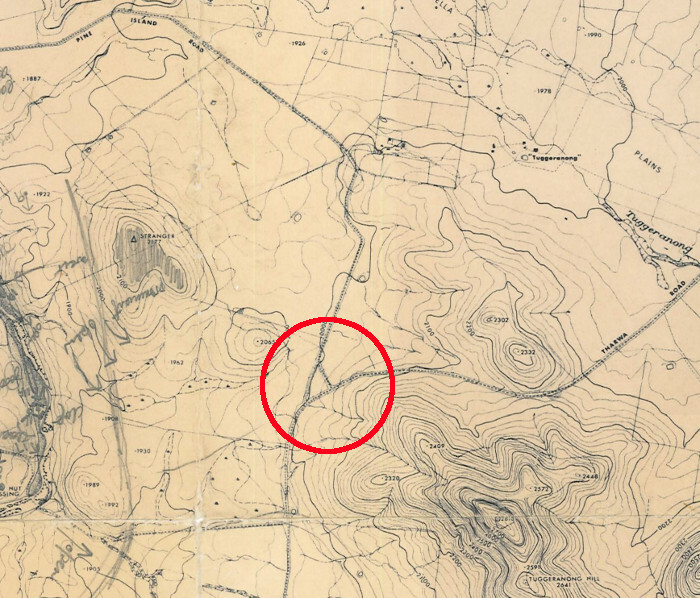 By referencing records available from ArchivesACT, in particular old maps, you can sometimes locate and track down what remains of these roads. We’ve used Google Maps to match the scale of those older maps, making comparisons between the two relatively easy. Fortunately, many natural features such as rivers and hills have remained essentially unchanged over time. These provide recognisable reference points when comparing maps. We are highlighting two of these early roads. Read about Tharwa Road below and click here for Long Gully Road. Although Canberra is a “planned city”, many of our current roads follow the same routes as the 19th century roads they replaced. Town planners also “repurposed’ some sections of early rural roads. For example, near the Tharwa Drive - Drakeford Drive intersection is a bicycle path that runs between Calwell and Gordon. As you can see in the first photo below, this bike path appears to have been laid on top of an earlier road. There is also another short section of sealed road with faded line markings running off the eastern end of this section of bike path. View Larger Map Here is a current aerial view of the area on Google Maps. The extract from a topographic map of Tuggeranong below dates from about 1970 and clearly shows this intersection (circled in red). This map was found amongst the papers of NCDC town planner Oskars Pumpurs. The Department of the Interior sealed both roads in the 1960s to improve public access to Pine Island, Lanyon and Tharwa. While much of the current-day Tharwa Drive follows the same route taken by the old Tharwa Road, this short section of the original road remains tucked away in a corner of Calwell. It has remained unused as a public road since the construction of Calwell and Gordon in the late 1980s. Extract from topographic map of Tuggeranong c1970 showing the Tharwa Road/Pine Island Road intersection. 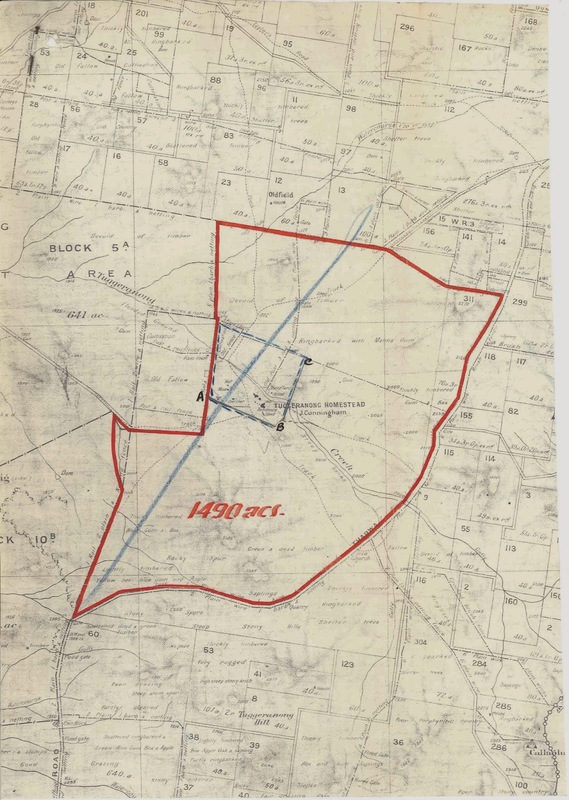 The following map, dating from the 1940s, shows the Tuggeranong Homestead site on Lanyon Block 28. Tharwa Road runs along the eastern and southern borders of this property, and our mystery intersection is close to the southernmost point of the block (circled in red). 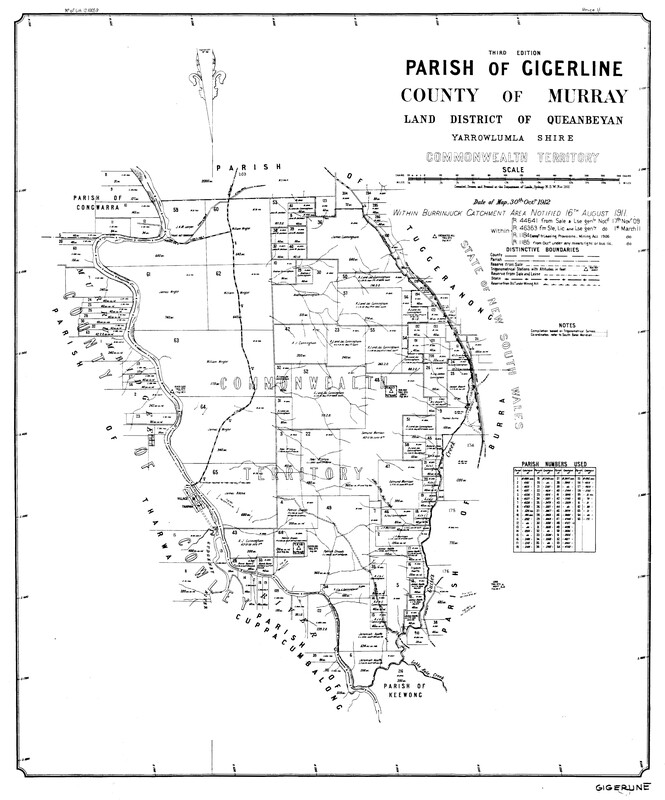 The short section of Pine Island Road that remains today does not appear on this map, indicating that it is a more recent construction. Map showing Lanyon Block 28 c1940s. From the file 'TL1132#02 - Department of the Interior - Property and Survey - Lanyon Block 28'. 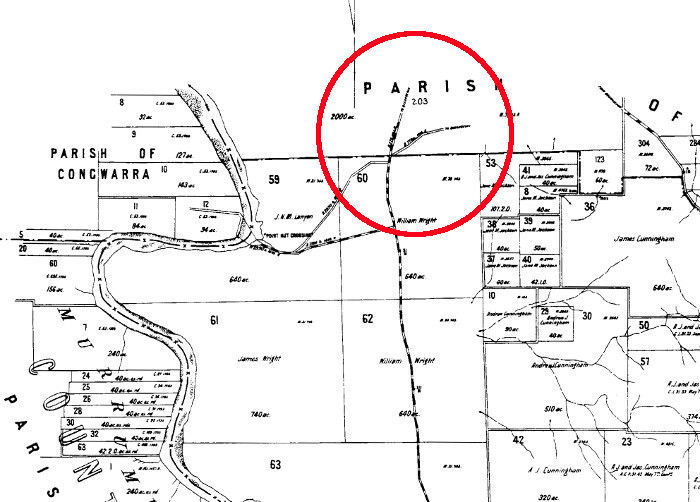 The following extract of the Parish of Gigerline map from 1912 shows this same section of Tharwa Road at the northern edge of the Parish (circled in red). 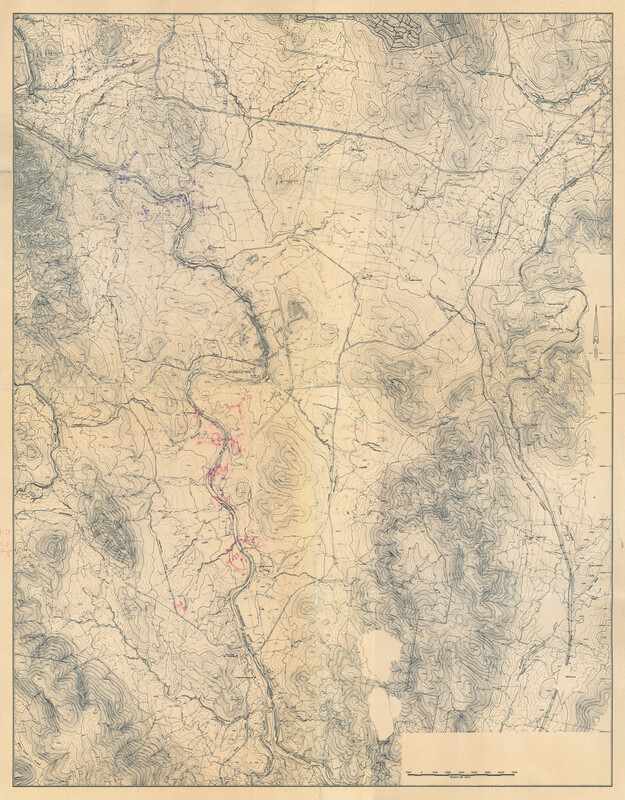 However, Tharwa Road is much older than this map, dating back to at least the 1830s. When the Commonwealth produced the map, Tharwa Bridge was already 17 years old and the Tharwa School had been in operation for 13 years. Tharwa itself was 50 years old, being proclaimed a settlement in 1862. 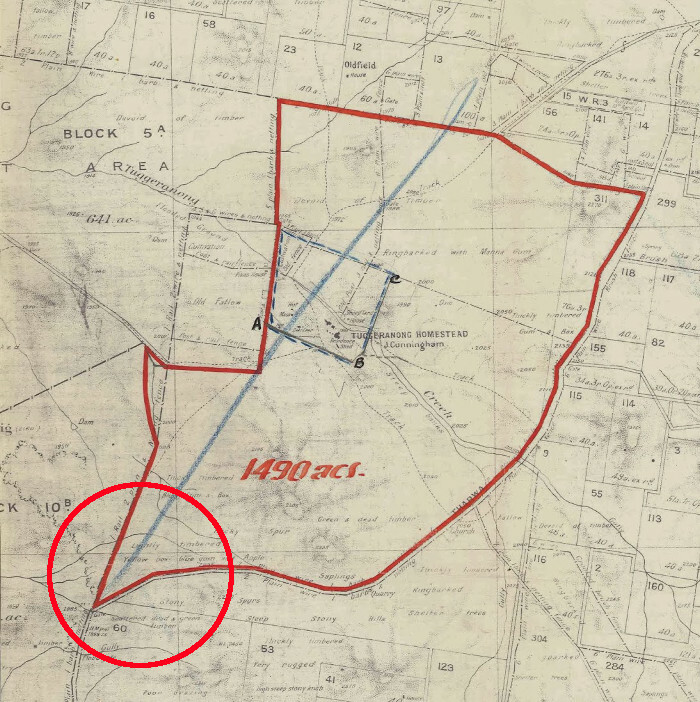 Extract from the map of the Parish of Gigerline 30th October 1912 from the Environment & Planning Directorate map room.